Yikes. We’re already almost a full week into November. I’ve been ramping up inventory for an artisan show I did this weekend, and for a local boutique called Finding Joy where I’m selling some jewelry designs on consignment. Stop in if you’re in the area! As part of that, I’m trying out a new letter stamp set. It’s called Gothic, and it’s just a simple lowercase 3mm font. It’s not quite as girly as my other font, Bridgette, and a little bolder than the uppercase Block stamps I use. All designs are available on Etsy or directly through the blog or message. Here are a few things I’ve done with it. Remember, everything is customizable. If you like something, I can tweak it however you want! 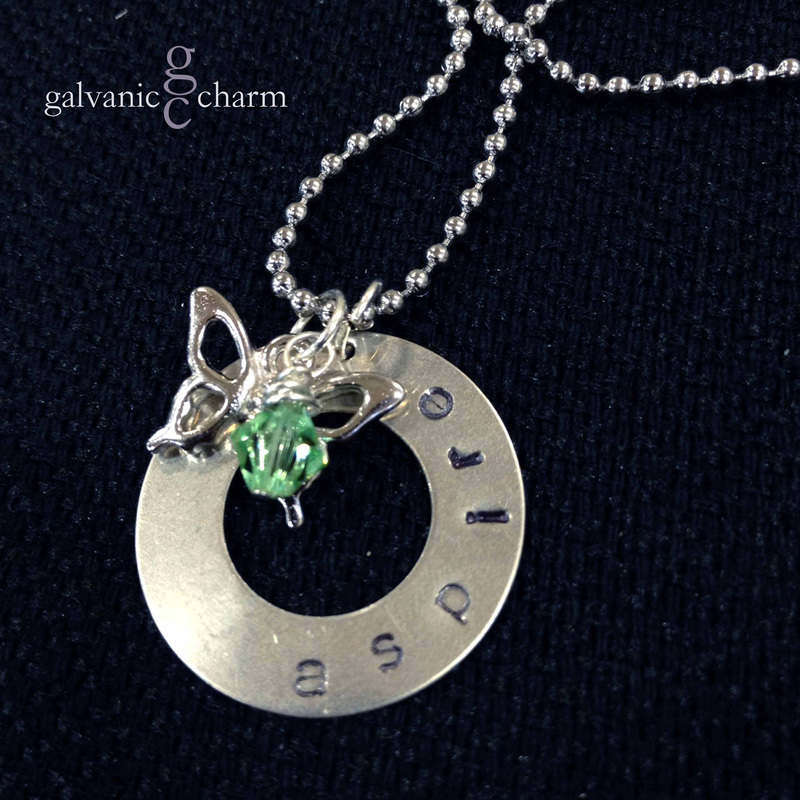 ASPIRE – Charm necklace with 1″ German silver washer, hand-stamped “aspire.” Pewter butterfly charm and wire wrapped light green Swarovski crystal drop. Stainless steel ball chain. $25 as shown. 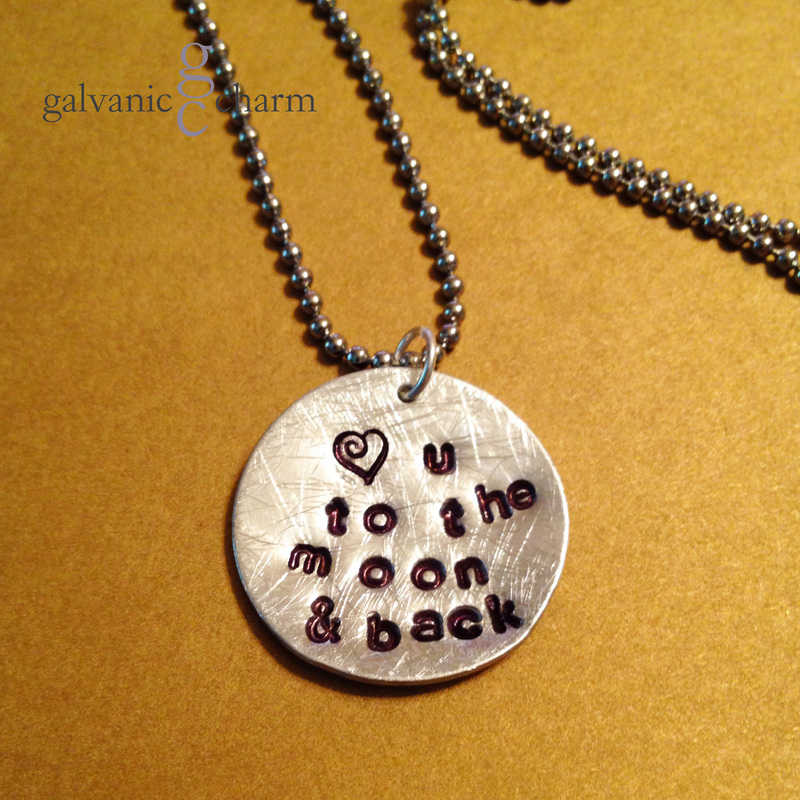 MOON AND BACK – 1″ German silver disc, hand-stamped with “<3 u to the moon & back.” 3mm lowercase Gothic font. Stainless steel ball chain. $20 as shown. 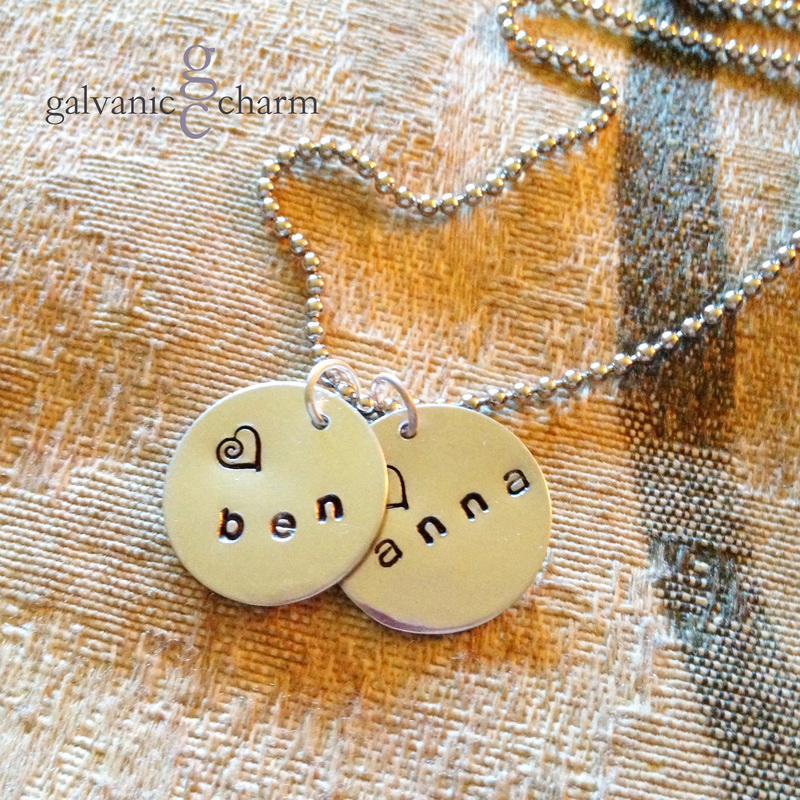 BENANNA – Mother’s necklace with two 1/2″ hand-stamped German silver circles. 3mm lowercase Gothic font. Stainless steel ball chain. $25 as shown. 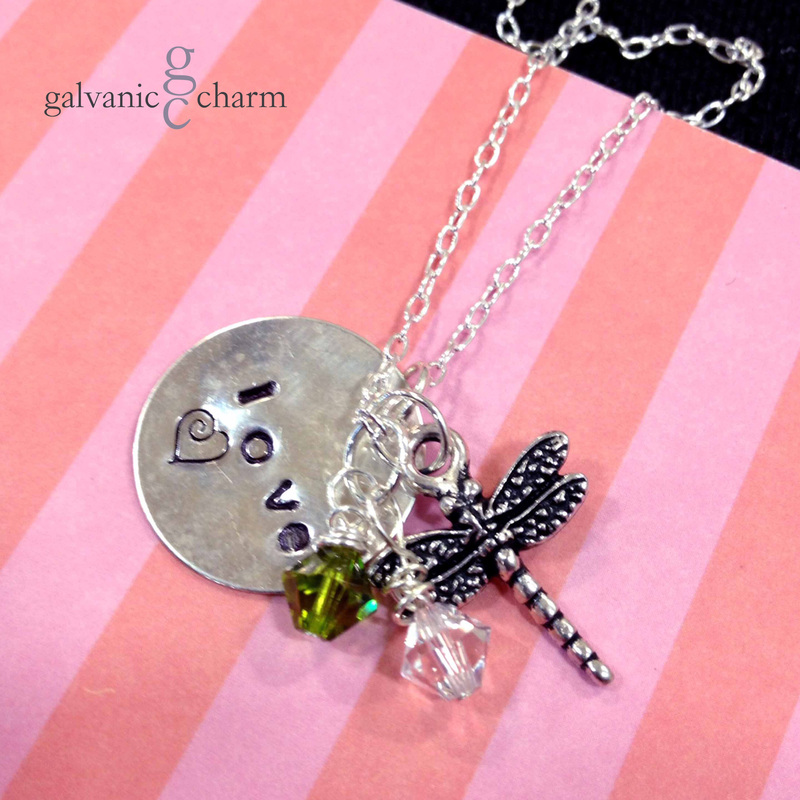 DRAGONLOVE – Charm necklace with 1″ .925 sterling silver disc, hand-stamped “love,” pewter dragonfly charm, and wire wrapped peridot and crystal Swarovski crystal drops. 18″ extra fine cable chain. $35 as shown. 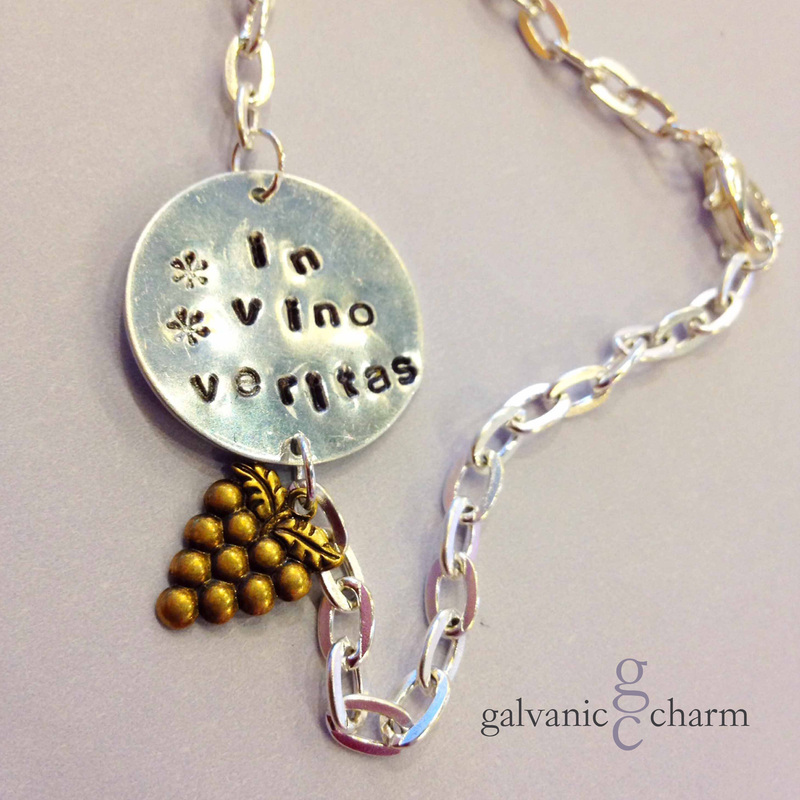 VERITAS – Charm bracelet with 1″ distressed German silver disc, hand-stamped with “in vino veritas,” translated “in wine is truth,” and brass grape bunch charm. 3mm lowercase Gothic font. 7.5″ silver plated cable chain. $15 as shown. 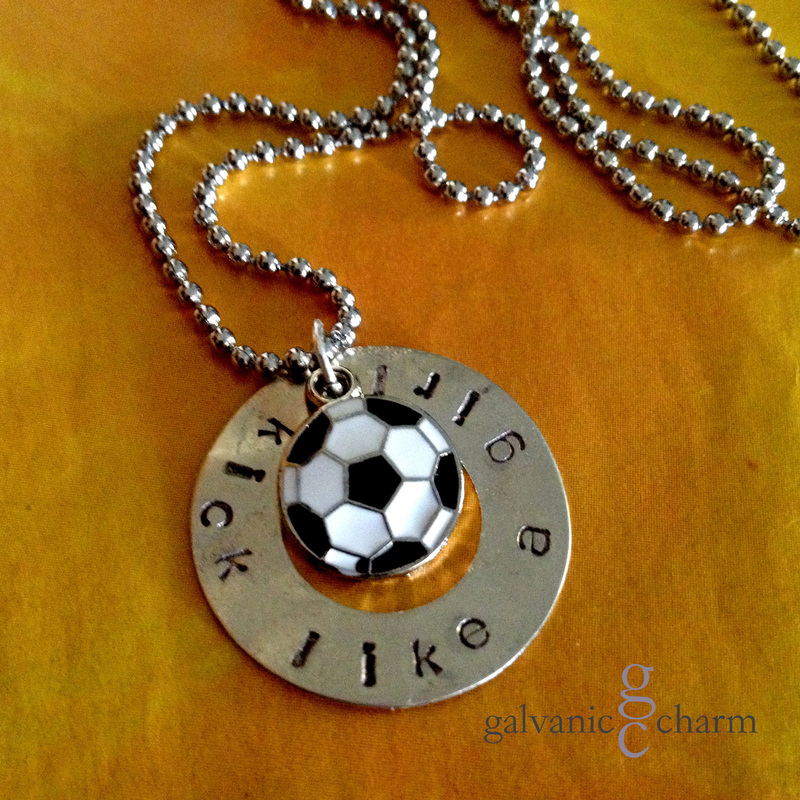 KICK – Perfect for any girl (or team of girls) to show her soccer superstarness, this 1 3/8″ nickel silver washer, is hand-stamped with “kick like a girl,” and features an enameled soccer ball charm. 3mm lowercase Gothic font. Stainless steel ball chain. $20 as shown. Bulk discount available for orders of 10 or more. 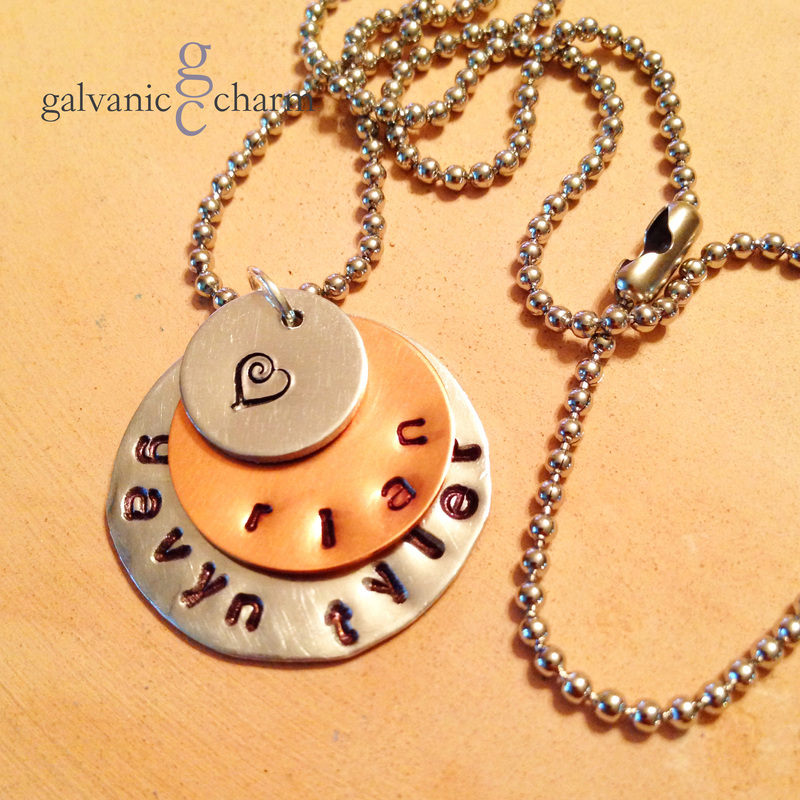 LAYERED – Mother’s necklace with 3 hand-stamped distressed German silver and copper circles, 3mm lowercase Gothic font. Stainless steel ball chain. $25 as shown. 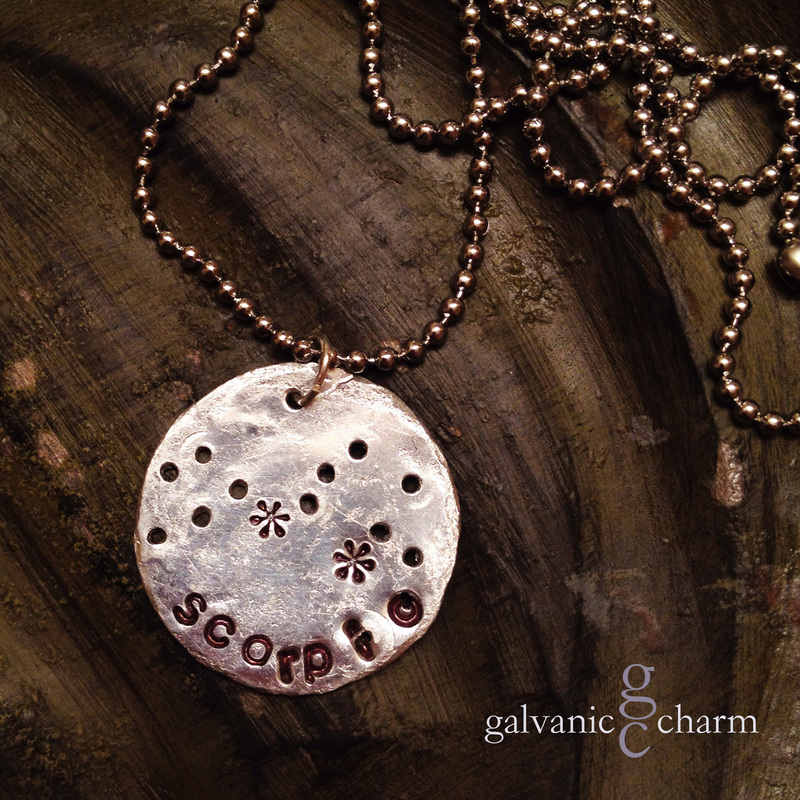 SCORPIO – Zodiac necklace with 1″ distressed German silver disc, hand-stamped (scorpio) and punched with Scorpio constellation. 3mm lowercase Gothic font. Stainless steel ball chain. $30 as shown. 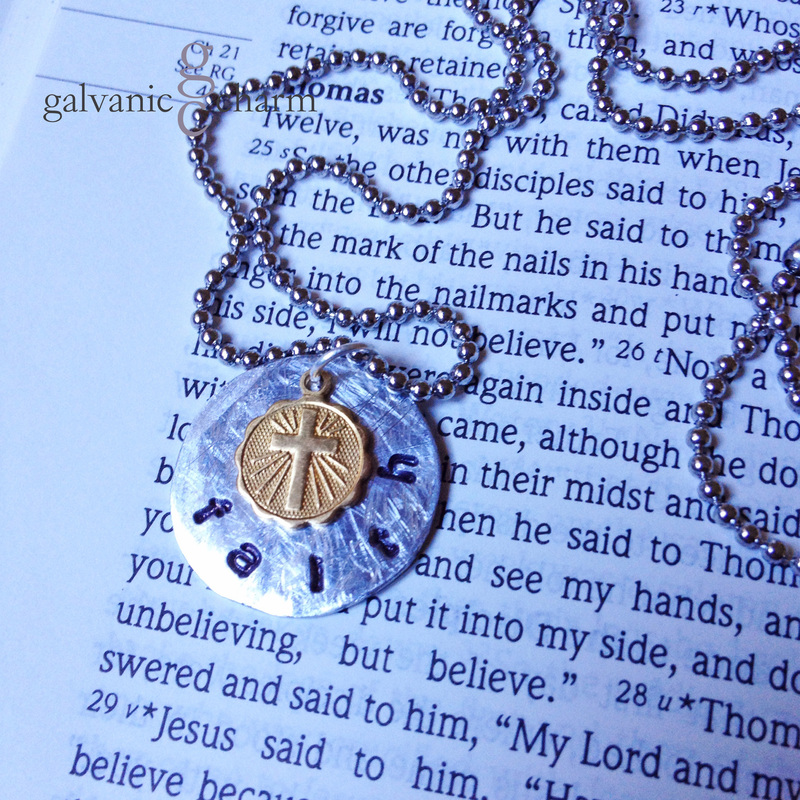 FAITH – A beautiful way to express devotion, this necklace has a 3/4″ distressed German silver circle, hand-stamped with “faith,” and features a circular 1/4″ brass cross charm . 3mm lowercase Gothic font. Stainless steel ball chain. $25 as shown. ROCK STAR – Have a favorite musician? 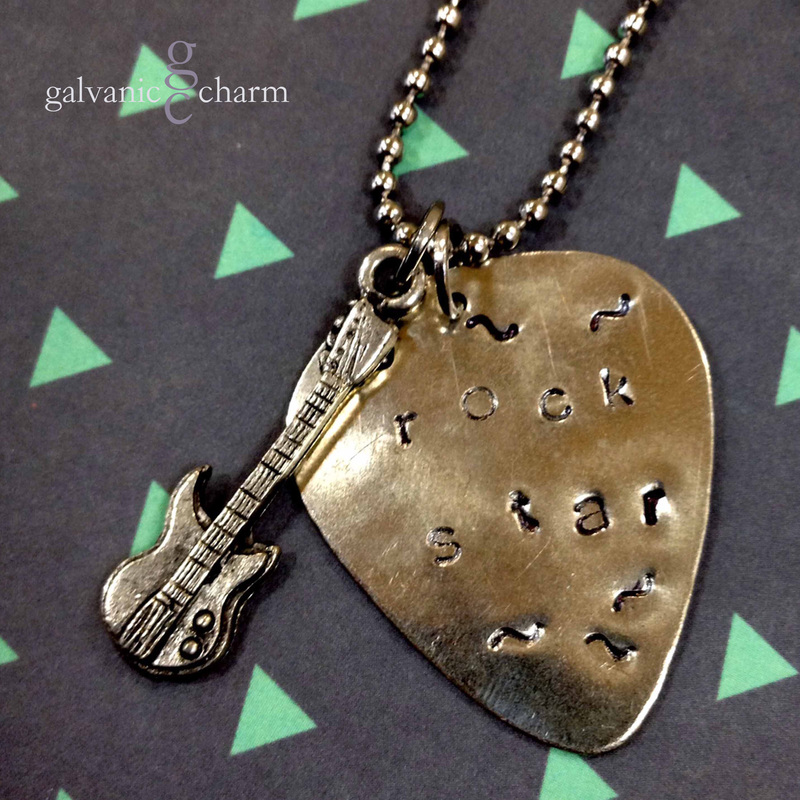 Here’s a necklace with a nickel silver guitar pick, hand-stamped “rock star,” with a pewter guitar charm. Stainless steel ball chain. $20 as shown.